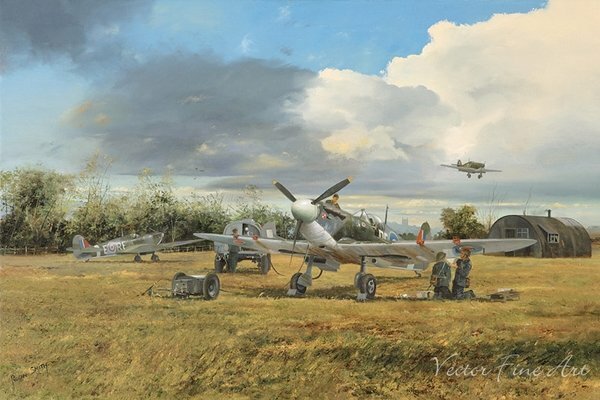 Overall Size 24" x 18"
Image Size 22 x 14-½"
This print depicts a Supermarine Spitfire Mk Vb of 303 (Polish Sqn.) flown by CO. Sqn. Ldr. J Zumbach. A quick and efficient turnaround of fighting aircraft on the front line was of paramount importance, and much was left in the hands of the all important ground crew. The importance of the so called "erks" which included such duties as armourers, re-fuelers, engine and airframe technicians etc. is often forgotten. Let us remember that without these people the aircraft would never have been able to take part in any action at all, and many were killed doing their duty on the ground.The image also helps to promote the fact that flying along side the Spitfires were Hawker Hurricanes, as one is indeed landing in the background.